The background color really makes the flower stand out. Quite lovely. Thanks Kathy! Glad you enjoyed it. What a beautiful way to wake up this morning. Thank you Laura. Also, honoring Debi is very kind, she is a very generous artist. As are you! Thank you, Sharon. what a beautiful drawing and painting Laura! I think back to your flowers of a year ago and how you struggled and how beautiful and uniquely you this is. Beautiful background radiating from the sketched flower. Simply beautiful! So lovely how amazing artists like Debi inspire us. I really love your blog – so inspirational! Wow, I am inspired by YOU. Thank you for your lovely work. You really have skills! Keep going. Looking forward to following your posts. They really are! I’m so glad you like this, Rebecca. It’s been a while since I’ve tried a flower. This photo was irresistible and Debi’s site is so inspirational! 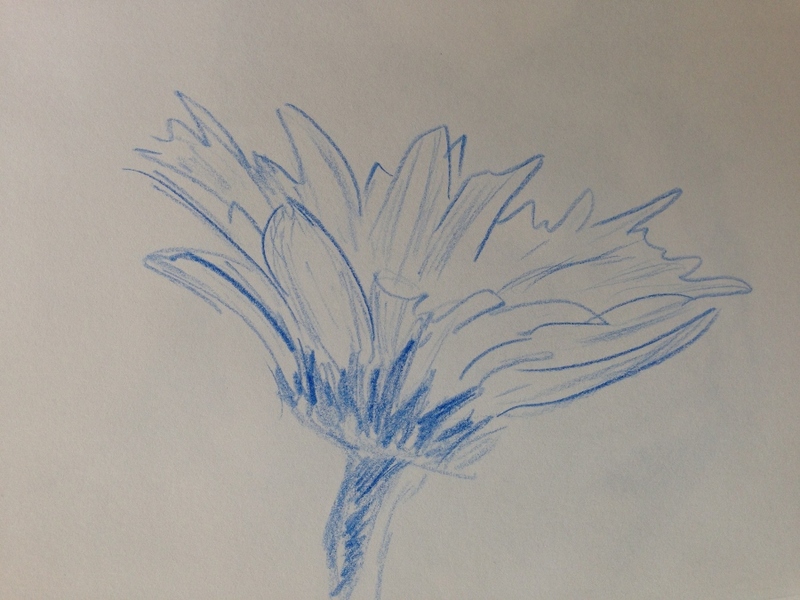 I really like your sketch of the flower. It is so alive with your pencil strokes. I have a really large tin of NeoColors II which I do not use. I used to use them to establish an initial layer of color before adding colored pencil. Hopefully one day I will get back to them! Thanks so much, Carmel. Omg. Please try them again. They would make quick work of a coat or pair of jeans! And you could blend them out so nicely. Very vibrant, rich color would be nice on your artwork. I hope you get them out again. I’d love to have the complete set. I have more than half but I need to get more. If I could buy a big tin, I would do it! They are worth it! That is wonderful. Nicely done. What a beautiful flower! I too could draw and paint the same subject matter over and over and see something new and unique each time. I love the vibrant yellow against the soft blue. You really have me curious about the soluble pastels. Thanks so much, Teresa! Isn’t it wonderful when a photo brings you such inspiration that you have to keep on going? Glad you liked it. Happy Sunday to you! 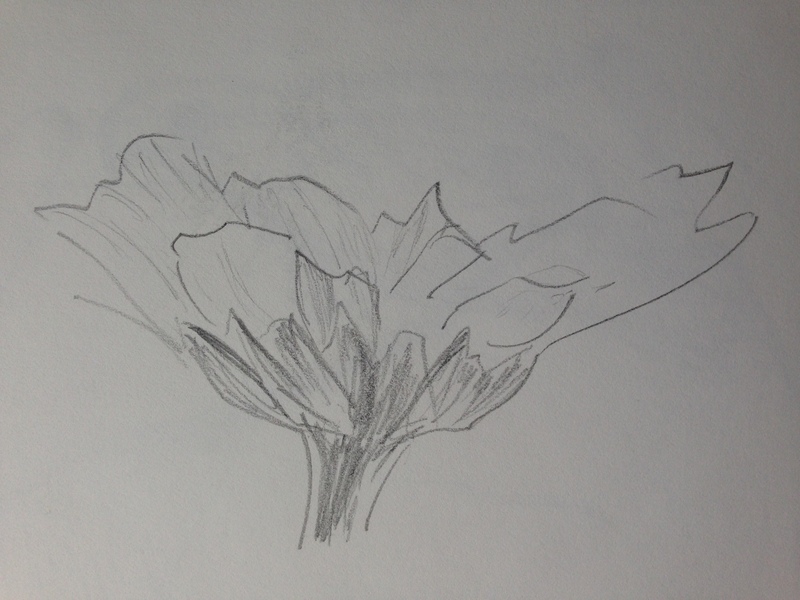 I like the way that you see more every time you draw this flower. What a lovely post! Thank you! It was lots of fun. I may prefer drawing to painting. Great way to learn to see. It has a Warhol-ish look to me in a great way. Very bold yet delicate at the same time. N.
Nina, wow, what can I say? I’m humbled by your kindness. Thank you. gorgeous eye popping Happy Flower Laura! smiling indeed! loving the warmth of the yellow and the coolness of the complementary teal, that You Chose. I’m so happy to have inspired you a bit on your journey Laura!! Thank you for the links and ‘shout out’ which is very sweet. Smiling Again! Thanks, Jill! Glad you enjoyed it! Thanks Charlie! The middle picture was done with Polychromos, but the painting with the yellow background – is it the yellows you like? They are all neocolor IIs. I love them!!! Polys are great too! Thanks Kerfe. Love those neos! I should try this with some other things too. I like how you are always combining techniques too, something I should try more of myself. Usually it’s lazy artist syndrome, grabbing whatever’s closest and easiest while in front of the tv. I’ve been thinking more about mixed media lately too. What gorgeous yellow. I have the small set but mine don’t seem to be as creamy as I see some people attesting to. Lovely drawing. Thanks Suz! There really are some rich warm yellows and oranges in their line. Beautifully done, love the warmth and the glow. Really appreciate your perspective, the more drawings that are made, the more we ‘see’ our subject. Delightful posting, thank you for sharing. Beautiful with the yellow background Laura ~ have a great week. Thanks, Mary, and you the same! Great color! I will have to look for that type of color pencils they are so beautiful and vibrant in color! Nice drawing Laura! Thanks, Jennifer! 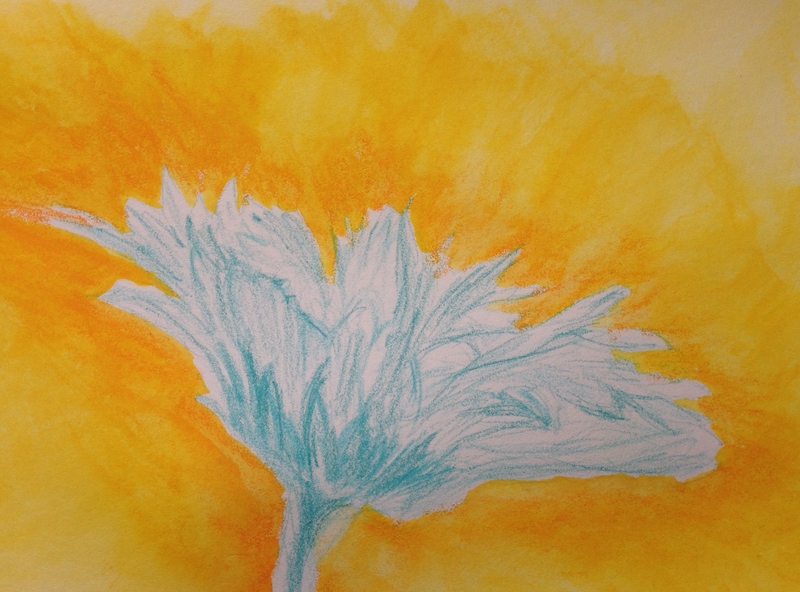 The blue is Polychromos colored pencil but the yellow is what I used in the peacock, which is a water soluble crayon. Doesn’t sound too appealing but they are a joy to work with. Love the Polys too! There was some confusion about this so I wanted to be sure you knew which was which in the painting. Yes thanks for clearing it up, I wasn’t sure which was the polychromes. Always like trying something new.